You ought to read this address given by the man in charge of implementing the corrected translation of the Roman Missal into English for the Archdiocese of Denver, Bishop James Conley. This is superb, properly framed in Catholic theology and liturgical tradition, and just down right inspiring. Let me say this: I’m very excited about the changes that are coming and about the opportunities we have for an authentic liturgical renewal. Practically speaking, implementing the new Missal means that all of us will be learning new translations of long-familiar prayers and responses. 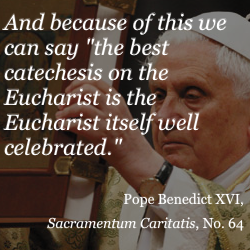 This makes it a perfect moment in the life of the Church for a new “eucharistic catechesis”.